In my travels through Texas and around the country, I encounter two types of people: those who believe that Austin College is among the finest colleges in the country, and those who have never heard of Austin College. We are fortunate that our reputation is solid among those who know of us. Our talented alumni are tremendous ambassadors for us, and their accomplishments have built our reputation for excellence. To know us is indeed to love us! But as a small college, our reputational reach is limited, and we know that there are many high school students, parents, thought leaders, and even higher education mavens for whom Austin College is an absolute unknown. 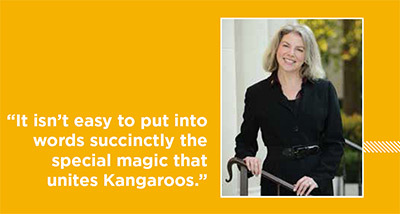 I am certain that, like me, you often find yourself in situations where you have to describe Austin College “from the ground up.” It isn’t easy to put into words succinctly the special magic that unites Kangaroos. I usually start by explaining that Austin College is a highly selective liberal arts college—the oldest one in Texas—with a strong commitment to both excellence and access. Our students are talented and diverse and look for an education that prepares them to lead and serve. Each of these statements is true, but alone they don’t fully convey our spirit. Over the past several years as I have honed my Austin College “elevator pitch,” I’ve come to add an additional descriptive: An Austin College education is distinguished by its unusual combination of rigor, adventure, and warmth. All together this makes for a compelling summary—one that invites my listeners to ask for more and to want to hear stories of how we embody those characteristics. I explain that the rigor of our curriculum and the high expectations our faculty members place on both students and themselves, mean that our students are challenged to do their very best work. They become well-educated critical thinkers, able to compete in lite professional and academic spheres. We provide adventurous learning platforms full of hands-on applications, including opportunities to travel the world, engage in research, manage our $1 million Student Investment Fund, curate an art exhibit, tour with a choir, engage with the community—and whatever else our students can dream up. The content of our curriculum is adventurous as well—every student encounters fields, perspectives, and intellectual tools that are unfamiliar and require courage to investigate. Moreover, the diversity of our community provides an adventure all its own as students eat, work, live, and play together. Finally, learning at Austin College takes place in the context of a warm and supportive community of peers and mentors. Rigor and adventure are balanced and encouraged by these strong relationships. Taking risks is easier when your faculty members are cheering you on and when you know that you and your work matter to them. As you recall your own experiences at Austin College, I am certain that you can find examples of rigor, adventure, and warmth. I encourage you to reflect on how those experiences affect you today. What have you taken from your college days that continues to shape your choices and direction? Think that through and then share that story. You are welcome to repeat my elevator speech or reframe it in your own words. And then go forth and it. Help us shrink the pool of those who do not know about Austin College and expand the pool of our admirers. In this issue of our magazine, you will read about several of our alumni who are living the liberal arts. Although their career fields differ, each of them has taken up the challenge of bringing rigor, adventure, and warmth to the work that engages them. They model the ways that Austin College graduates touch the world and devote themselves to making it better. As always, we would love to see you on campus, and we invite you to check our website regularly for updates on what is happening at Austin College.